Want to create a holograph with Maya? I designed this very easy to use hologram shader for a personal project and now I’m pleased to share it with you to use on your personal projects. Download Hologram Shader for Maya at Autodesk’s Area 3D community website. 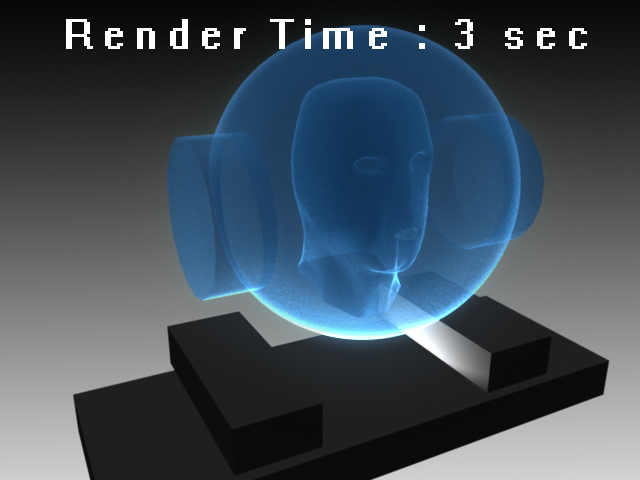 This is a simple procedural hologram shader for MAYA SOFTWARE renderer. The shader renders very fast and has a cool stylised look. It uses a lambert shader as its base with a samplerInfo node controlling the dropoff thus emulating a fresnel effect, this gives greater control to the artist by adjusting the holo_dropoff_ramp visually while making sure the fall off always faces outward. A perlin noise map ( Holo_noise ) is used to add depth and contour by mapping it to the bump channel. You can control this effect bump adjusting the holo_noise_bump depth. As a hologram is generated by emitting light you will need to add a light source to get the full effect as seen in the provided scene example. This will add more depth and contrast. Try using light linking to control the style without effecting the rest of the scene. The shader has been tested in Maya 2010 & 2011. The creator takes no responsibility or liability for the use of and subsequent modifications of this shader.